KILLARNEY – Three suspects have been arrested for armed robbery on 6 July. The three suspects that were arrested in Killarney by Hillbrow police for alleged armed robbery. 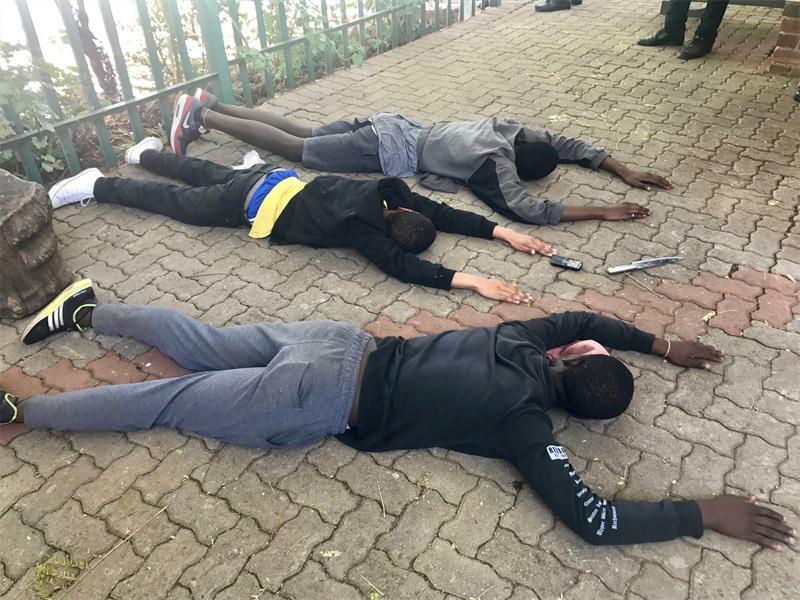 Three suspects have been arrested by Hillbrow police for allegedly terrorising the Killarney community over the past few days, said Vision Tactical director Yaseen Theba. “Over the past few days, we received reports that young children in the Killarney area were being harassed by a group of thugs that were allegedly robbing them of cell phones and money. Some domestics workers and gardeners also confirmed that the suspects were young and not from the area,” explained Theba. On 6 July a group of young boys ran into the park terrified after their money and phones were taken. The incident took place on 3rd and 2nd Avenue in Killarney. The spokesperson for Hillbrow Police Station Sergeant Mduduzi Zondo confirmed that the incident had in fact taken place at around 1 pm and that some of the suspects that were arrested are still minors. He also confirmed that a stolen cellphone was recovered and that one suspect allegedly had a knife with him. 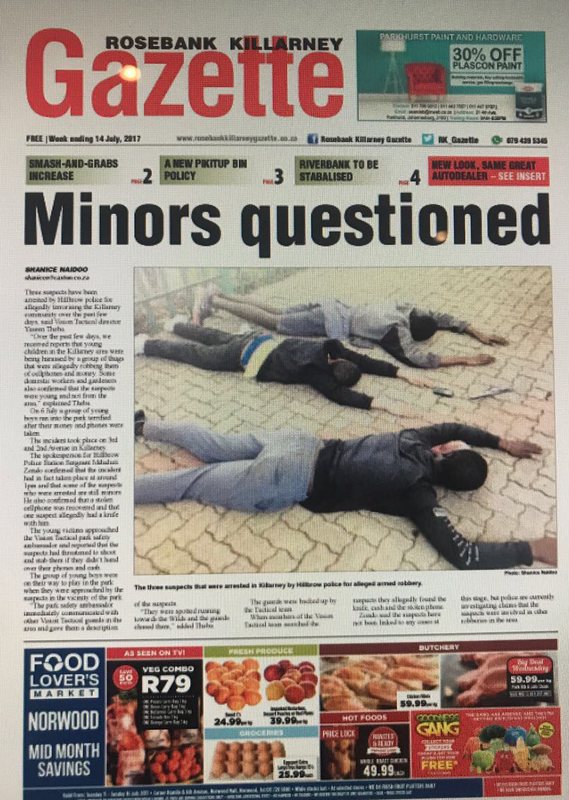 The young victims approached the Vision Tactical park safety ambassador and reported that the suspects had threatened to shoot and stab them if they didn’t hand over their phones and cash. The group of young boys were on their way to play in the park when they were approached by the suspects in the vicinity of the park. 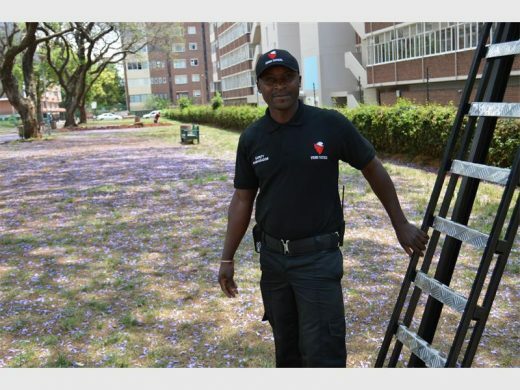 Vision Tactical park safety ambassador Eric Minnie, whose quick response resulted in the apprehension of three alleged robbers in the Killarney area. “The park safety ambassador immediately communicated with other Vision Tactical guards in the area and gave them a description of the suspects. They were spotted running towards the Wilds and the guards chased them,” added Theba. The guards were backed up by the Tactical team. When members of the Vision Tactical team searched the suspects they allegedly found a knife, cash and the stolen phone. Zondo said the suspects have not been linked to any cases at this stage, but police are currently investigating claims that the suspects were involved in other robberies.